Dr. Mehta completed his undergraduate studies in 2010 with an Honours Bachelor of Science (HBSc) degree in Biotechnology from the University of Toronto. With a strong passion for dentistry, he continued his education at the University of Debrecen in Hungary where he received his Doctor of Dental Medicine (DMD) degree in 2015. 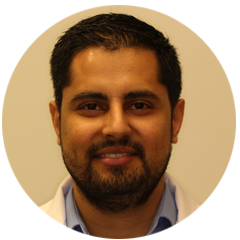 Dr. Mehta is now a practicing member of the Royal College of Dental Surgeons of Ontario (RCDSO). Outside of the office, he loves to watch his favorite team, the Toronto Maple Leafs in action and is eagerly waiting for them to finally win the Stanley Cup. His hobbies include collecting coins, fixing things around the home, and learning about emerging technologies. Being a coffee enthusiast, you can often find him brewing a delicious cup of coffee for his friends and family. As the newest member of the Sapphire Dental team, Dr. Mehta is committed to providing the highest quality of care to his patients. He takes pride in lifelong learning and continues to improve his skills by participating in continuing dental education programs. Most importantly, Dr. Mehta is dedicated to consistently providing a positive patient experience; his calm demeanor, patience, and approachability are sure to make you feel at ease. Amazing experience! Dr. Nibu is an expert in his field. He made me feel comfortable and confident in his expertise. Simply wow! Dr. Nibu went above and beyond and helped to restore my smile. I can now smile confidently. Excellent service : Dr. Nibu is very professional, knowledgeable and kind. He has a naturally pleasing personality.